Alsatian rabbi; born at Niederbronn, Lower Alsace, June 14, 1849. He was educated at the lyceum of Strasburg and the rabbinical seminary in Paris, receiving the degrees of doctor and chief rabbi, his thesis being "Les Arts et les Métiers chez les Anciens Juifs Selon la Bible et le Talmud." 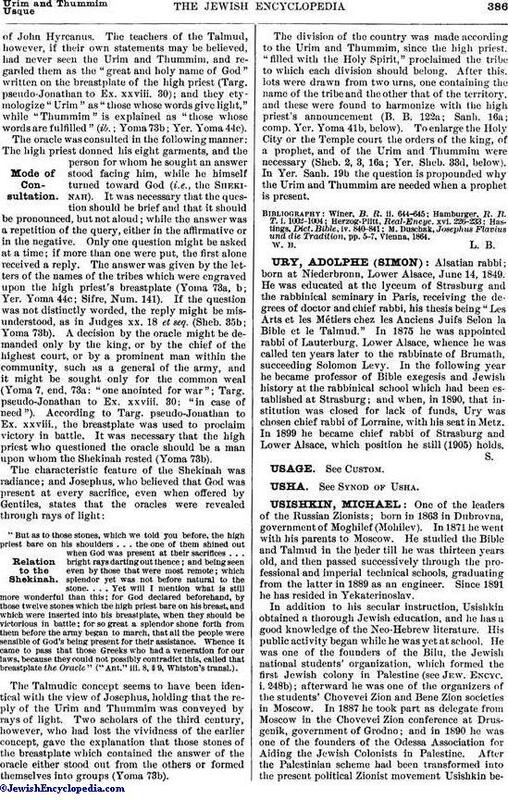 In 1875 he was appointed rabbi of Lauterburg, Lower Alsace, whence he was called ten years later to the rabbinate of Brumath, succeeding Solomon Levy. In the following year he became professor of Bible exegesis and Jewish history at the rabbinical school which had been established at Strasburg; and when, in 1890, that institution was closed for lack of funds, Ury was chosen chief rabbi of Lorraine, with his seat in Metz. In 1899 he became chief rabbi of Strasburg and Lower Alsace, which position he still (1905) holds.